I read this article and found it very interesting, thought it might be something for you. The article is called Maximize Your Training with Resting Heart Rate (RHR) – Data Thursday and is located at https://runfastacademy.com/maximize-training-resting-heart-rate-rhr-data-thursday/. As we’ve learned in finding your Maximum Heart Rate (MHR), Resting Heart Rate (RHR) is another number you’ll need to find out your optimal heart rate training zone. Finding RHR is much easier than MHR. Put on your heart rate monitor/watch. Find a quiet room where you can sit down and rest. Relax and breath deeply for 3 minutes. Look at your HR monitor/watch to get your RHR. If you don’t have a HR monitor/watch, simply count the beats of your pulse on neck or wrist for 20 seconds and multiply it by 3. For accurate number test your RHR only after your easy day or off day. You can do RHR test anytime you want (eg once in 2 months) and key in the new number in your sports app setting. In Garmin Connect app, go to Garmin Devices, choose your device and select “User Settings”. 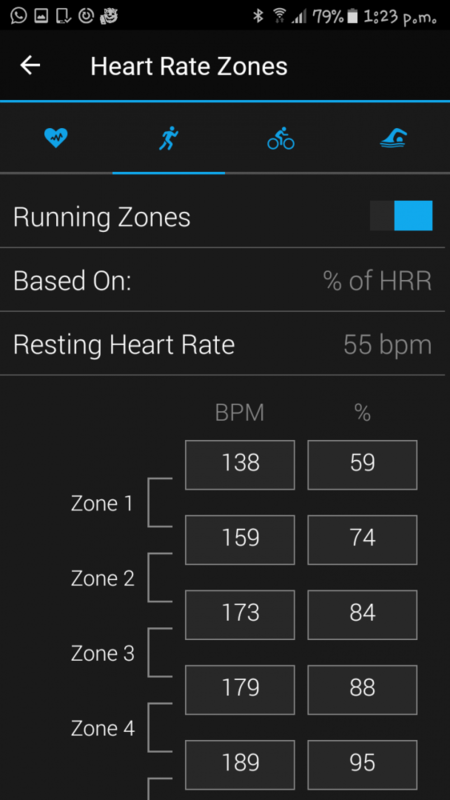 Select “Configure Heart Rate Zones” and set your RHR. Aside from heart rate training zone, RHR can be used to monitor your recovery after your last workout. In the morning simply sit on the bed for 1 minute and check your RHR (you don’t have to wear your watch to sleep if you don’t want to. You can put it aside your bed). It is normal to see your RHR slightly elevated after having a workout in previous day. However if this continues for many days you should take note on your training and physical condition. Chances are you are over-training and need extra recovery day. When you do aerobic training long enough, your heart will become more efficient. Your ventricular muscles will become stronger which allows your heart to pump more blood per beat than before. To pump the same amount of blood, your heart now requires less beats as the volume per beat has increased. In other words, lower RHR (and lower HR training zone) is a sign of fitness level improvement.